Saint Joseph the Hymnographer, "the sweet-voiced nightingale of the Church," was born in Sicily in 816 into a pious Christian family. His parents, Plotinos and Agatha, moved to the Peloponnesos to save themselves from barbarian invasions. When he was fifteen, St Joseph went to Thessalonica and entered the monastery of Latomos. He was distinguished by his piety, his love for work, his meekness, and he gained the good will of all the brethren of the monastery. He was later ordained as a priest. St Gregory the Dekapolite (November 20) visited the monastery and took notice of the young monk, taking him along to Constantinople, where they settled together near the church of the holy Martyrs Sergius and Bacchus. This was during the reign of the emperor Leo the Armenian (813-820), a time of fierce iconoclast persecution. Sts Gregory and Joseph fearlessly defended the veneration of holy icons. They preached in the city squares and visited in the homes of the Orthodox, encouraging them against the heretics. The Church of Constantinople was in a was most grievous position. Not only the emperor, but also the patriarch were iconoclast heretics. At that time the Roman bishops were in communion with the Eastern Church, and Pope Leo III, who was not under the dominion of the Byzantine Emperor, was able to render great help to the Orthodox. The Orthodox monks chose St Joseph as a steadfast and eloquent messenger to the Pope. St Gregory blessed him to journey to Rome and to report on the plight of the Church of Constantinople, the atrocities of the iconoclasts, and the dangers threatening Orthodoxy. During the journey, St Joseph was captured by Arab brigands who had been bribed by the iconoclasts. They took him to the island of Crete, where they handed him over to the iconoclasts, who locked him up in prison. Bravely enduring all the deprivations, he encouraged the other prisoners. By his prayers, a certain Orthodox bishop who had begun to waver was strengthened in spirit and courageously accepted martyrdom. St Joseph spent six years in prison. 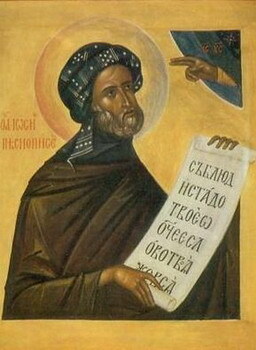 On the night of the Nativity of Christ in 820 he was granted a vision of St Nicholas of Myra, who told him about the death of the iconoclast Leo the Armenian, and the end of the persecution. St Nicholas gave him a paper scroll and said, "Take this scroll and eat it." On the scroll was written: "Hasten, O Gracious One, and come to our aid if possible and as You will, for You are the Merciful One." The monk read the scroll, ate it and said, "How sweet are Thine oracles to my throat" (Ps 118/119:103). St Nicholas bade him to sing these words. After this the fetters fell off the saint, the doors of the prison opened, and he emerged from it. He was transported through the air and set down on a large road near Constantinople, leading into the city. When he reached Constantinople, St Joseph found that St Gregory the Dekapolite was no longer among the living, leaving behind his disciple John (April 18), who soon died. St Joseph built a church dedicated to St Nicholas and transferred the relics of Sts Gregory and John there. A monastery was founded near the church. St Joseph received a portion of the relics of the Apostle Bartholomew from a certain virtuous man. He built a church in memory of the holy apostle. He loved and honored St Bartholomew, and he was distressed that there was no Canon glorifying the holy Apostle. He desired to adorn the Feast of St Bartholomew with hymns, but he did not dare to compose them himself. For forty days St Joseph prayed with tears, preparing for the Feast of the holy apostle. On the eve of the Feast the Apostle Bartholomew appeared to him in the altar. He pressed the holy Gospel to Joseph's bosom, and blessed him to write church hymns with the words, "May the right hand of the Almighty God bless you, may your tongue pour forth waters of heavenly wisdom, may your heart be a temple of the Holy Spirit, and may your hymnody delight the entire world." After this miraculous appearance, St Joseph composed a Canon to the Apostle Bartholomew, and from that time he began to compose hymns and Canons in honor of the Mother of God, of the saints, and in honor of St Nicholas, who liberated him from prison. During the revival of the iconoclast heresy under the emperor Theophilus (829-842), St Joseph suffered a second time from the heretics. He was exiled to Cherson [Chersonessus] for eleven years. The Orthodox veneration of holy icons was restored under the holy empress Theodora (February 11) in 842, and St Joseph was made keeper of sacred vessels at Hagia Sophia in Constantinople. Because of his bold denunciation of the brother of the empress, Bardas, for unlawful cohabitation, the saint was again sent into exile and returned only after Bardas died in 867. Having reached old age, St Joseph fell ill. On Great and Holy Friday, the Lord informed him of his approaching demise in a dream. The saint made an inventory of the church articles in Hagia Sophia, which were under his official care, and he sent it to Patriarch Photius. For several days he prayed intensely, preparing for death. He prayed for peace for the Church, and the mercy of God for his soul. Having received the Holy Mysteries of Christ, St Joseph blessed all who came to him, and with joy he fell asleep in the Lord (+ 863). The choirs of the angels and the saints, whom St Joseph had glorified in his hymnology, carried his soul to Heaven in triumph. In 890, his biographer John the deacon of the Great Church wrote about the spirit and power of St Joseph's Canons: "When he began to write verses, then the hearing was taken with a wondrous pleasantness of sound, and the heart was struck by the power of the thought. Those who strive for a life of perfection find a respite here. Writers, having left off with their other versification, from this one treasure-trove, from the writings of St Joseph, began to scoop out his treasure for their own songs, or better to say, daily they scoop them out. And finally, all the people carry it over into their own language, so as to enlighten with song the darkness of night, or staving off sleep, to continue with the vigil until sunrise. If anyone were peruse the life of a saint of the Church on any given day, they would see the worthiness of St Joseph's hymns and acknowledge his glorious life. Actually, since the lives and deeds of almost every saint are adorned with praises, is not he worthy of immortal glory, who has worthily and exquisitely known how to glorify them? Now let some saints glorify his meekness, and others his wisdom, and others his works, and all together glorify the grace of the Holy Spirit, Who so abundantly and immeasurably has bestown his gifts on him." Most of the Canons in the MENAION are St Joseph's work. His name may be found in the Ninth Ode as an acrostic. He also composed many of the hymns in the PARAKLETIKE. Who lauded and praised the assembly of the saints. And now he is glorified with them. according to the words of David. and described the grace they received through their labors. Therefore, we cry to you: "Rejoice, O blessed harp of holy melody!"